A viral infection may affect multiple different locations on the body and when it is on the skin, it can lead to a temporary rash. Most of the time this rash will go away after just a few days, but they can occasionally last two weeks. Viral rashes don’t usually lead to pain or itching and because of this, there isn’t any necessary treatment. In some cases, however, an infection of a more serious nature will appear as a viral rash initially and because of this, you should know how to treat viral rashes in children as well as when to visit a doctor. What Is a Viral Rash? The appearance and symptoms of a viral rash will greatly depend on the virus that caused it and the rash may just be one of the symptoms. 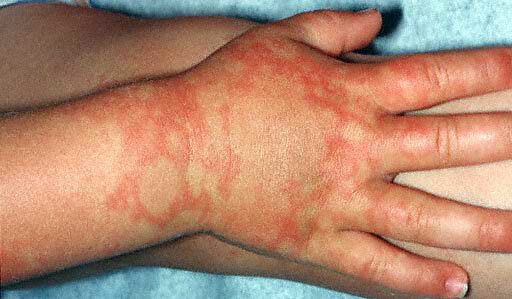 In these cases, the rash may help your child’s doctor diagnose the virus behind the illness. 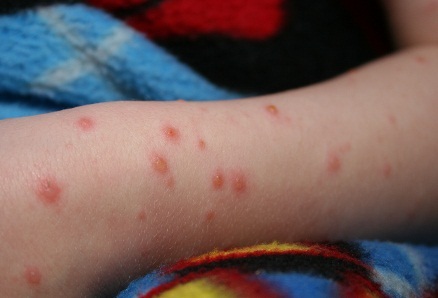 Multiple viruses will lead to a rash as well as other symptoms such as cough or fever and sometimes the rashes are nonspecific, meaning they aren’t unique enough to identify the cause. A viral rash will vary in terms of size and shape, but they are frequently blotchy red spots that usually affect the majority of the body. Sometimes they will suddenly appear or itch, but usually they disappear within a few days. It takes 10 to 20 days for symptoms to appear and they last about two weeks. This is caused by varicella-zoster virus and it can be serious for those with HIV, pregnant women, those taking steroids, newborns or people doing chemotherapy. The rash appears three of four days in and lasts 7 days. This is caused by a paramyxovirus. Symptoms of rubella, or German measles, start 14 to 21 days after exposure. It is caused by the virus, Rubivirus. The rash lasts one or two days. It is caused by parvovirus B19 and also known as “slapped cheeks” disease or erythema infectiosum. The rash appears after the fever which can last 8 days. It is due to the herpes virus 6 or 7. The symptoms usually go away within ten days. This is caused by the virus coxsackie. The rash will appear around five days after a high fever. It is probably due to a viral infection, but the specifics still aren’t known. Chickenpox first appears as an incredibly itchy rash on the scalp, groin or armpits that then spreads over the whole body in waves. The rash starts with a small, superficial blister surrounded by red skin. The blister ruptures, so the lesion creates a crust. Additional symptoms including red eyes, sore throat, malaiseand fever, and the last two of these may come before the rash. Measles will usually start with high fever, lethargy, cough, swelling and tearing, eye rednessand nasal congestion. Around the third to fourth day, the child will get a rash on his face. This rash spreads quickly, lasting around 7 days. It is also possible to get another rash with white spots in the mouth on the gums. Rubella starts with a red to pink facial rash that spreads throughout the rest of the child’s body and then improves in around 4 days. It is possible that your child won’t appear very ill, but will still develop symptoms such as swollen lymph nodes in his neck, particularly behind the ears. In the beginning, your child will feel tired and ill, and then the rash comes. The rash appears as bright red cheeks (also known as “slapped cheeks disease”) and is not tender, but warm and occasionally itchy. In one or two days, the lacy rash spreads on the body. It will fade a bit when the skin feels cool, but if the child is active or takes a warm bath, it gets more noticeable. The child isn’t contagious once he has the rash. 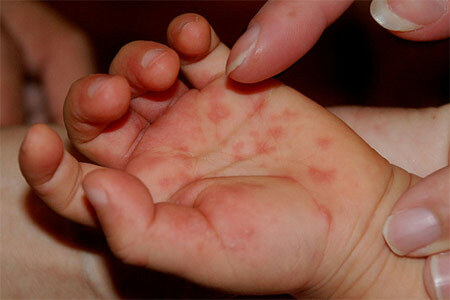 There is a high fever that spikes for a maximum of eight days and then the rash appears. The rash consists of slightly raised or flat lesions which are small and pink. They start on the trunkthen spread to your child’s extremities. This disease leads to painful sores or rashes in the throat, mouth, feet, hands, and occasionally the buttocks. Most small children and toddlers with it will get a fever, appear extremely tired or weak, or lose their appetites. The symptoms usually go away in ten days. In this disease the blood vessel walls become inflamed and that makes it dangerous. The symptoms start as reddened eyes and a high fever. Five days later there will be a red patchy rash on the trunk. Most of the time the tongue and throat become dark red, and the feet and hands may swell and turn purple. The neck’s lymph nodes are also usually swollen. If your child has a fever, he will be experiencing an increase in water loss. If your baby is under one year old, keep doing regular feedings, but give him an oral rehydration solution (like Pedialyte) between them. If your child is over a year, have him drink or eat plenty of fluids including juice, water, Jello-Oand popsicles. If your kid prefers not to have solid foods for several days, don’t worry. Just make sure he gets enough fluid during this time. When your child has a viral rash, encourage him to nap frequently. Also keep your child at home, so he can stay quietly or rest. He can go back to school or day care if his fever is gone and he is feeling better and eating well. It is common for your child to be irritable and sleepless. If your child is congested, try propping his upper body and head up with pillows. You can put your infant in his car seat on top of the bed. As a parent you should make sure that your child doesn’t scratch the rash and to do so, keep his fingernails short and clean. You should also let the skin breathe by dressing him in cotton clothing. You can sometimes decrease itching with an oatmeal bath (like the one by Aveeno). You can also moisten the skin and decrease your child’s urge to scratch with a topical cream like Hydrocortisone. You can sometimes use an oral antihistamine such as Benadryl. If you do, however, always make sure to carefully follow the directions and never use both the oral and topical form of Benadryl at the same time unless your child’s doctor tells you to do so. You can also relieve body aches and fever with medications like Motrin or Tylenol.